The time of year you wear your heart on your sleeve and maintain a seemingly unlimited supply of chocolates. Ah, Valentine’s Day—the time for love and upset stomachs (though hopefully these two things aren’t closely linked). Romantic words flow coquettishly from your lips. You playfully toss out Valentine’s words and phrases. But wait—how could you amp up the romance factor? Might we suggest a bouquet of poems? Not only can they increase the romance, but they’re also a powerful learning tool and an excellent strategy to improve your reading. Romance is in the air. Prepare yourself with some poems! Why Read Romantic Spanish Poems? It’s obvious that learning romantic poems is great for romance. After all, Spanish is a “Romance language.” While this actually means that it originates from the language spoken by the Romans, we tend to forget this and just treat it as a romantic language. It’s cool, though. As a Spanish language learner, this confusion will only work to your benefit. And what’s more romantic than a love poem in a language associated with romance? Not to mention, descriptive, colorful, lyrical poetry is a great tool for learning vocabulary. If you memorize a poem, you’ll never forget those words. This is great for building vocabulary with lots of context. For instance, some words in poems you won’t need on a regular basis. If you don’t use a word regularly, it can be hard to remember it. However, if you have a poem memorized that contains that word, you’ll have no trouble reciting the poem quickly in your head to remember your missing vocabulary word. Poems are also helpful for practicing speaking. Since they often have a good rhythm and sometimes even rhyme, they’re relatively easy (and often enjoyable) to speak aloud. This will help you get your pronunciation and accent down. 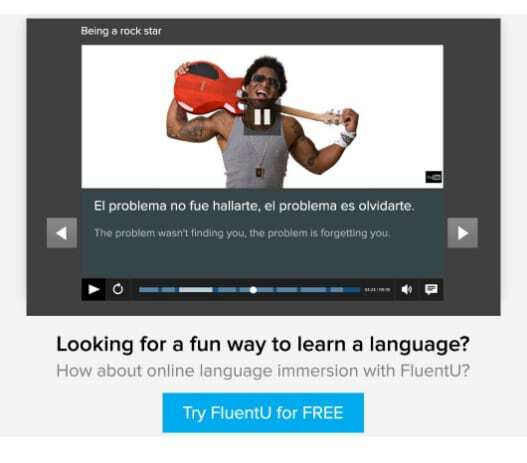 In fact, whenever you can practice with authentic content (created for native Spanish speakers), you should, since it’s one of the best ways to start speaking like a native yourself! 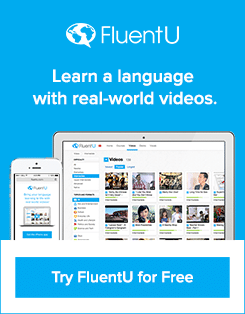 The best resource for this type of content is FluentU, which takes real-world videos—like movie trailers, music videos, vlogs, speeches, poems and more—and turns them into personalized language lessons. With all these great benefits in mind, try these 10 romantic poems as a great jumping off point for learning and romance. “Amemos” (“Let’s Love”) is great for the existentialist romantic. It reflects on how love relates to the meaning of life and existence. If you want to memorize a love poem, this is an excellent option. It’s short, just eight lines long. It also uses rhyme, so it will be easier to memorize. While most of the vocabulary will be familiar to beginning Spanish students, it features some less familiar vocabulary like tinieblas (darkness) and arcano (secret/mystery), so you’ll learn some new words. In love with Amado Nervo yet? If so, check out one of his many anthologies. You could try this one, this one, this one or this one. 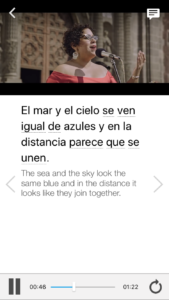 “El día que me quieras” (“The Day That You Love Me”) is about how beautiful the world will be when “you” love “me,” so it’s a great poem to read to someone you’re hoping to start up a romance with. 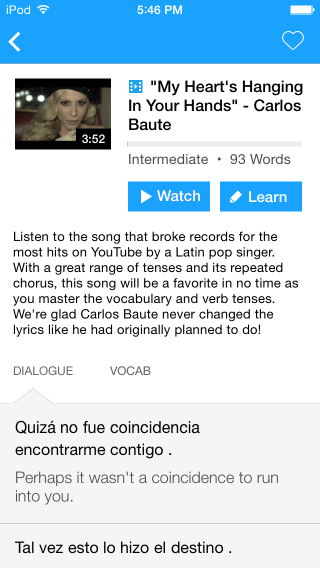 “El día que me quieras” uses a lot of future tense, so it’s great for anyone who wants practice in this area. The vocabulary is relatively simple with a few more advanced vocabulary words like éxtasis (ecstasy), lucir (to shine) and apasionadamente (passionately), so beginners and advanced speakers alike will benefit from this poem. And if you’ve just now decided you love Amado Nervo, don’t forget to go check out the anthologies listed under the last poem. “San Valentín” (“Saint Valentine”) is a poem of unknown origin about Valentine’s Day itself. The theme couldn’t be more on point. It focuses on how love is more important than material objects, so it’s a great poem to recite for your loved one if you forget to buy a gift. It rhymes some, though the pattern isn’t as clear or consistent as Amado Nervo’s poems. Still, the rhyme makes it easier to memorize or recite. The vocabulary is pretty simple and the poem uses mostly present tense verbs, so this is a good option for beginners. A few vocabulary words that might be less familiar include rendirse (to surrender) and llenar (to fill). “Un amor” (“One love”) focuses on missing a loved one, so this is great if you’re trying to win back an ex. “Un amor” doesn’t rhyme and has intermediate vocabulary, so this poem will be a little harder to commit to memory. The upside is that it has a more natural, speech-like flow. 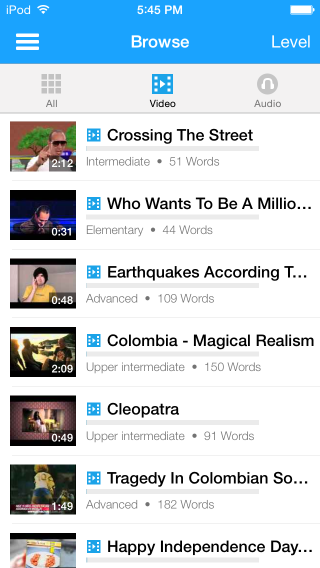 It’s best for intermediate and advanced speakers. Watch out for some vocabulary words that might be unfamiliar like rostro (face), atar (to tie), herida (wound/injury), dañar (to damage/spoil), caricia (caress), adivinar (to discern) and acechar (to stalk/spy on). It’s also available in this collection of poems. Like “Un amor,” “Te recuerdo como eras en el último otoño” (“I remember you as you were last autumn”) is about love and loss, so it’s great for trying to win back an ex or the traditional Valentine’s Day pastime of wallowing in self pity. This poem does not rhyme and has some pretty advanced vocabulary, so it’s probably best for advanced speakers or particularly ambitious beginning and intermediate speakers. There are a number of interesting vocabulary words you might be unfamiliar with: boina (beret), llamas (flames), crepúsculo (twilight), hoguera (bonfire), torcido (twisted), anhelos (desires), brasa (hot coal/ember), estanque (pond) and girar (to turn/spin). If Pablo Neruda’s work touches your heart, you might want to check out a bilingual anthology of some of his poems, his love poems or 100 of his love sonnets. “¿Qué es poesía?” (“What is Poetry?”) basically compares the author’s beloved to poetry, so it’s a great poem to read to your significant other (unless he or she hates poetry). 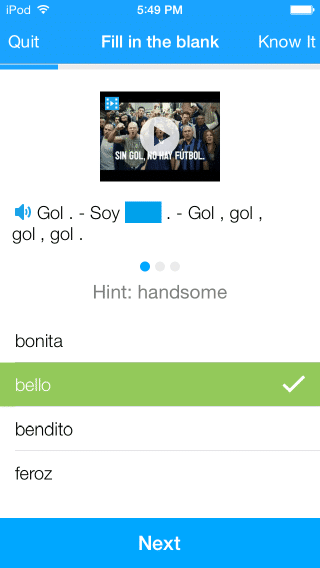 It’s incredibly brief (just four lines), so it should be easy for any level of Spanish speaker to master. This poem is also available in this collection of Gustavo Adolfo Bécquer’s work. “Hora tras hora” (“Hour After Hour”) literally discusses nature, but it seems to be a metaphor for love. The hidden depth will leave your beloved scratching his/her head as he/she tries to interpret the poem, but it’ll certainly make you look deep. This poem uses a little bit of rhyme and is relatively short (15 lines), so it shouldn’t be too hard to learn. It’s most appropriate for intermediate level speakers. Some words to watch out for are vigías (watchmen), despeñar (to throw/fall over a cliff) and marchitar (to wither). You can check out Rosalía de Castro’s other poems in this handy volume of poems in both Galician and Castilian Spanish. “Gacela del amor imprevisto” means “Gacela of Unforeseen Love.” A gacela is simply a type of Arabic verse. The poem focuses on despair over faded passions. Though the poem is actually about the decline of civilization, it can be seen as a romantic poem, albeit a slightly creepy one. Use with caution, as your beloved may not like the allusions to blood and death. This poem uses rhyme which will make it easier to speak and/or memorize. However, the vocabulary and content are slightly heavier, so this would be better for intermediate and advanced Spanish speakers. Some words that could trip you up include martirizar (to martyr), colibrí (hummingbird), enlazar (to link), yeso (plaster), pálido (pale) and marfil (ivory). You can also read more of Federico García Lorca’s poems in both this volume and this volume. “Llama de amor viva” (“Living Flame of Love”) is about the connection between love and pain, but it portrays that pain in a positive light. It has a strong rhyming scheme, but it also has some challenging words, so while it’s easy enough to memorize, you might need to work harder to learn all the vocabulary. A few key vocabulary words to pay attention to are llama (flame), tiernamente (tenderly), herir (to wound/injure), esquiva (elusive), cautiverio (captivity), llaga (wound), trocar (to barter), manso (meek) and morar (to dwell). “Llama de amor viva” is also available in this collection of works by San Juan de la Cruz. “Soneto XXVII” (“Sonnet XXVII”) is about how love causes both joy and sorrow and how those two feelings go hand in hand. It might not be a great poem to woo your beloved with, but it’s a good way to reflect on the nature of love. The tight rhyming scheme in this poem will make it easy for anyone to memorize, and it’s also relatively brief. There are, however, some vocabulary words that might be unfamiliar such as paño (cloth), ancho (wide), apretado (tight), estrecho (narrow), congojado (distressed) and osar (to dare). “Soneto XXVII” is also available in this collection of sonetos (sonnets) by Garcilaso de la Vega. With these 10 romantic poems in your repertoire, you’re ready to have a great Valentine’s Day!